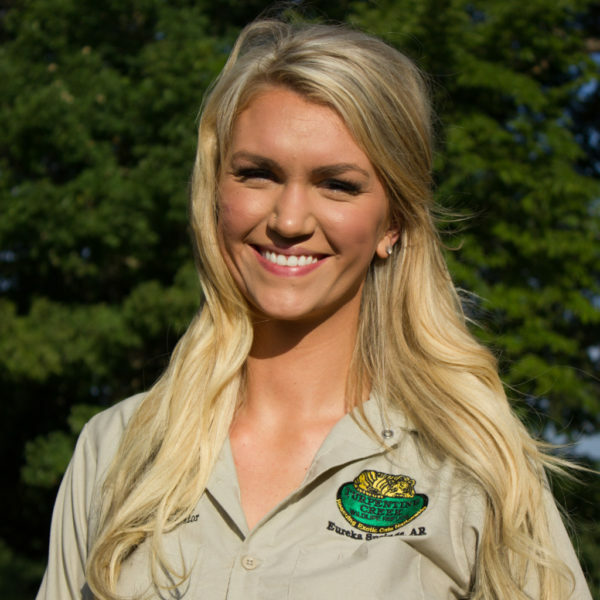 Turpentine Creek Wildlife Refuge is Miranda Dawn Smith’s entire life –literally. Born in Hope, Arkansas, Miranda moved to the Refuge before she was even a year old. Miranda’s mother, Tanya Jackson-Smith and her grandparents, Don and Hilda Jackson are the founders of TCWR –meaning that her upbringing was a unique one for sure! She knew the appropriate ways in which to care for big cats before most people her age figured out how to litter box train their first house cat. Working with animals was and still is a very important part of her daily life. After graduating from the University of Arkansas, Fayetteville with a degree in Hospitality and Restaurant Management in 2015, Miranda stepped into the role of TCWR’s Hospitality Coordinator. In this role, she manages the lodging department, the downtown gift shop, and assists in education promotions and networking events. When not on the clock, you will find Miranda spreading the word about TCWR’s mission in hopes of carrying on her family’s legacy of providing these beautiful animals with a forever home. Whether out in the field or behind a desk, Miranda feels that every job at TCWR is an integral part of the Refuge’s success because we are all working hard to help the animals!